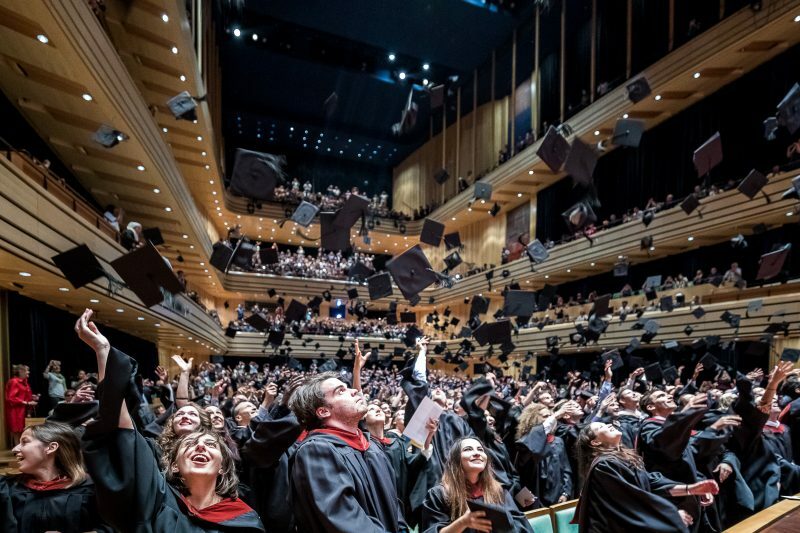 Central European University students celebrating their graduation in Budapest, June 22, 2018. Photo by CEU/Zoltan Adrian (Kepszerkesztoseg), CC BY-NC-ND 2.0. Disclaimer: The author of this article is a Central European University (CEU) graduate in the class of 2018. Editor's note: Global Voices is a grantee of the Open Society Foundations, part of the Soros network. The destiny of Central European University (CEU) in Budapest, Hungary remains uncertain while it struggles with the Hungarian government over its legal standing based on new higher education amendments introduced in 2017. The university, founded by Hungarian-American financier George Soros and registered in the United States (US), now faces a possible shut down due to regulations that require all foreign universities to register with their home countries before signing bilateral agreements with Hungary. CEU believes they have been targeted in an ongoing conflict rooted in populist tensions gripping Hungary and Central Europe. This was a relief to CEU’s staff of 1,160, as well as to prospective students who wondered whether their campus would be shut down due to legal battles when Hungarian Prime Minister Viktor Orbán's government accused CEU of noncompliance with the new law, unofficially referred to as ‘lex CEU,’ (Latin for ‘CEU law’). In 2017, draft legislation presented the new amendments requiring foreign institutions operating in Hungary to open campuses in the country in which they are registered and then sign a bilateral educational agreement with the Hungarian government. While CEU's campus is located in Hungary, the university is registered in the United States (US) and primarily awards US diplomas, with a few exceptions of programs that are also accredited in Hungary. Critics of the amendment view it as an attack on CEU. In the months following its announcement, multiple demonstrations were organized in Budapest and over 500 prominent American and European academics, including 20 Nobel laureates, signed an open letter in support of CEU. The statement refers to the Hungarian government’s highly anticipated report about their visit to Bard College in New York, USA, which plans to host some of CEU’s programs in accordance with lex CEU. Despite its vexatious requirements, CEU says it was able to comply with the new laws by acquiring “an official letter from New York state authorities, released [June 26, which] confirms that CEU is indeed offering higher education activities in New York, and is thus in full compliance with lex CEU” as stated in a document attached to the Rector's email. Despite securing this letter from New York state authorities, it is still unclear whether the Hungarian government is willing to sign the required bilateral education agreement with the US. Rector Ignatieff referred to this dilemma as a state of “legal limbo” which is far from over. Experts and netizens believe that the Hungarian government may be playing a waiting game with CEU by delaying their decision so that the university will shut down on its own to avoid direct responsibility for CEU's exit from Hungary. Official CEU emails from March informed the community about the establishment of a satellite campus in Vienna, Austria which could serve as a new home in case the university does not receive authorization from the Hungarian government to continue operations. In its most recent statement, CEU announced opportunities to learn at both the Budapest and future Vienna campus. I don’t think students will be deterred from attending CEU if it isn’t in Budapest. I’m going follow it wherever it goes. The quality of education will not change, but it’d be a pity to have to move somewhere else. Budapest has been home to CEU since 1993, directly contributing to the Hungarian economy through taxes, and indirectly by attracting students from about 120 countries who enjoy Budapest's cultural scene, nightlife, and countryside. Incoming student Sunna Kokkonen told GV that the only thing that worries her about a possible move to Vienna is whether her diploma will be accredited in the EU and not just the US. She added that before accepting the offer of admission, she had little knowledge of what was happening at CEU. Why is a top university in Central Eastern Europe facing harassment? Many of Hungary's prominent government officials graduated from CEU, considered to be a top university in Central Eastern Europe, leaving many to wonder why the Hungarian government has focused so heavily on CEU compliance. A handful of other foreign universities are operating in the country, but they usually register within the EU and only have satellite campuses in Hungary, therefore making compliance much simpler. The conflict may stem from the university's association with Soros, whose organization, the Open Society Foundation, awarded a scholarship to current Hungarian Prime Minister Viktor Orbán in 1989. This is in stark contrast to Orbán's current right-wing populist government who has presented Soros as a public enemy to Hungarians, spending millions of euros of taxpayers’ money on costly defamation campaigns against him. Theories on Hungary's singular focus on CEU range from a Freudian interpretation of Orbán’s life to the prime minister's wish to be invited to the White House by US president Donald Trump. The most widely accepted theory, however, is that a populist leader needs a public enemy and in this case, CEU serves as the scapegoat. CEU's decision to remain in Budapest forces Orbán’s cabinet to make and announce their final decision on renewing the school’s license. If the license is not renewed, CEU must cease operations in Budapest. But judging by the university's recent statement, the institution is confident, that it will eligible for license renewal. Meanwhile, Orbán's Hungarian-Civic Alliance (known as the Fidesz party) risks “expulsion from the European People’s Party, the biggest group in the European Parliament which has shielded the populist leader from criticism over the erosion of democracy.” The influential Hungarian website Index.hu claims that even Fidesz representatives are clueless about Orbán's next move.